so i apologize to the lovely author for taking SO long to review this story, but i'm glad i finally got to it! recommended for: People looking for a fun, quick read with a surprise ending. While I didn't like this story as much as Ratliff's other story Little Bernie's Map (which was brilliantly creepy and had a super clever concept), I still think he has a lot of promise as an author. 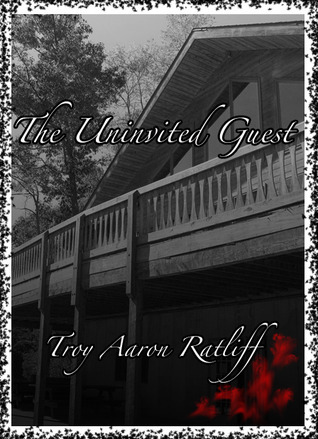 The Uninvited Guest has a very clear concept of character. The narrator feels authentic as an apathetic teenager, and his friend brings some nice, funny moments. What made me feel less excited about this story was the somewhat over long introduction. I felt like I didn't really know where I was headed or what was trying to be said. I don't usually read a lot of genre short stories, so maybe it's just not my thing. I thought the surprise would have worked better with more foreshadowing, though, for greater impact. Overall, the writing was good and I hope to see Ratliff grow as a writer. This was the main part of the story that lost me. The beginning was very long and seemed to be primarily about the wedding festivities. I knew that something bad was going to happen, per the blurb, but I didn't feel it. In Little Bernie's Map, there was a sense of creepiness from early on. The narrator kept mentioning "what happened later", but this was too blunt for foreshadowing. Instead of feeling the slow build of anticipation like I did in Ratliff's other story, I was just waiting to finally get some answers. I think with a shorter beginning and more subtle foreshadowing, the final surprise would stand stronger. The concept was interesting for a thrill, but I don't think it was as strong as Map. The wedding didn't seem to serve much purpose except for providing a group of people for the horrific event to happen to. However, the wedding took up much more of the page space than the attack did, which kept making me wonder what it was trying to say. I think the attack could have been worked in a little more to the beginning to send a stronger message. I really liked the narrator. He reminded me of someone I could know. A carefree, self-conscious, slightly freeloading nineteen-year-old. Secretly affected by the romantic goings-on but also mostly occupied mentally with the buffet. His friend, Jose, was a funny but unexplored side character. I would have liked to know more about the bride and groom, since they played such an important symbolic role. Ratliff has a very clean writing style that allows the characters and plot to show through. He has a good sense of voice. His narrator felt authentic. However, it got repetitive in some places. The food and certain things about the wedding were mentioned several times, so that they were amusing the first but seemed less interesting after a repetition or two. I think tightening overall would have made this story shine more. There were some grammar error and typos that I would have liked to see corrected. However, generally the formatting was good. A quick, fun read with an endearing narrator and a surprise ending. Note: I received this copy free from the author. The price of the book and its origin in no way affected my stated opinions.